The men escaped through the pickup's windows shortly before it sank Monday afternoon beneath the Pleasant River Bridge, according to one passenger. Five men had to scramble out the windows of a pickup truck after it slid off an icy stretch of road and plunged into the Pleasant River in Windham on Monday afternoon. “By the grace of God, we made it out alive,” 84-year-old Kenneth Brann of Windham, one of the passengers, said in a telephone interview Monday night. 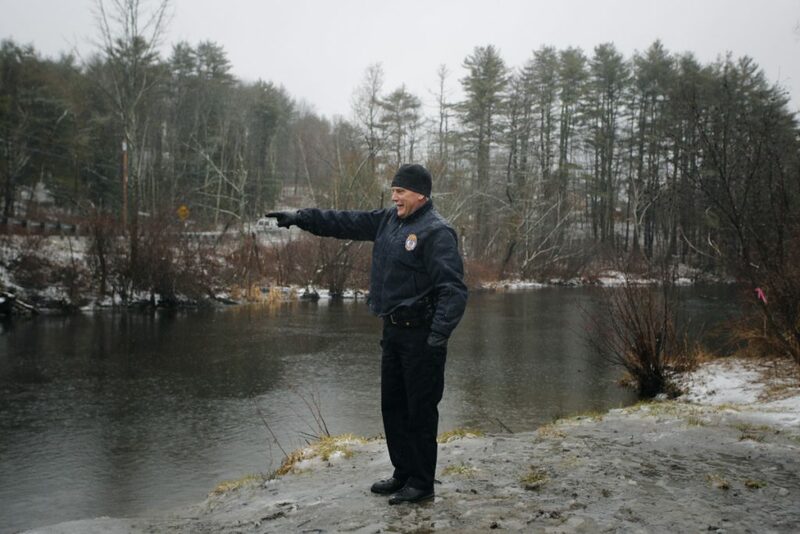 Peter Fulton of the Windham police points toward a GMC pickup truck submerged in Pleasant River after it left River Road while traveling northbound on Monday afternoon. There were five people in the 2015 GMC crew cab pickup – two up front and three in the rear seating area of the truck driven by Bradley Woodbrey, 65, of Raymond, Windham police said in a news release. Woodbrey was driving north on River Road in icy conditions when he lost control of the vehicle on a downhill section approaching the Pleasant River Bridge around 1 p.m. Rain mixed with sleet and freezing rain had been falling in the area all afternoon. The truck doors would not open, but the five men escaped through the truck’s windows and scrambled onto a liner covering the pickup bed. They grabbed onto the steel I-beams on the underside of the bridge as the truck floated beneath it in the current, Brann said. They were able to stop the truck from floating any further downstream and began guiding it toward shore, Brann said. But then it began to sink and they were forced to wade and swim to shore, said Brann, who had been in the passenger seat behind Woodbrey. 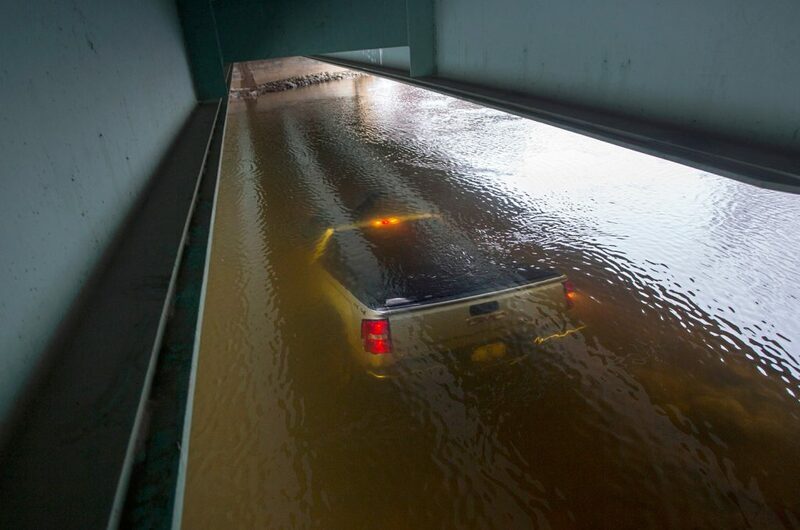 The truck came to rest completely submerged under the bridge with its tail lights still lit. Windham police identified the passengers as Brann, 73-year-old Dennis Brooks, 80-year-old Norman Dunn, and 59-year-old Richard Holman, all of Windham. The men were treated for minor exposure, but none required hospitalization. “We checked them for injuries, made sure they’re warm and dry, and then (they) met with the police department to do a report,” Windham Fire Chief Brent Libby said. Libby said River Road was slick when his crews arrived. Libby said the state Department of Environmental Protection was notified so crews could remove the vehicle, which is likely to require a diver, he said. According to Brann, Woodbrey owns Sebago Lake Automotive in Windham. The four men agreed to drive four of his dealership vehicles to Kittery on Monday morning for a car auction. Woodbrey was driving the men home to Windham when the accident took place. “To end up in the river. Now that was scary,” said Brann, who after returning home treated himself to a hot shower and started a fire in his fireplace. Brann credited the men for remaining relatively calm and ensuring that everyone made it to safety. He also credits a higher power. “Every day, when I leave my house I say a prayer for a safe journey,” Brann said.